Image Size: 35 X 26 in. Atomizer in hand, this dedicated, selfless and (as indicated by the overreaction to the unfamiliar on this young boy’s face) perhaps slightly misunderstood physician practices his healing ways in this frontier home. 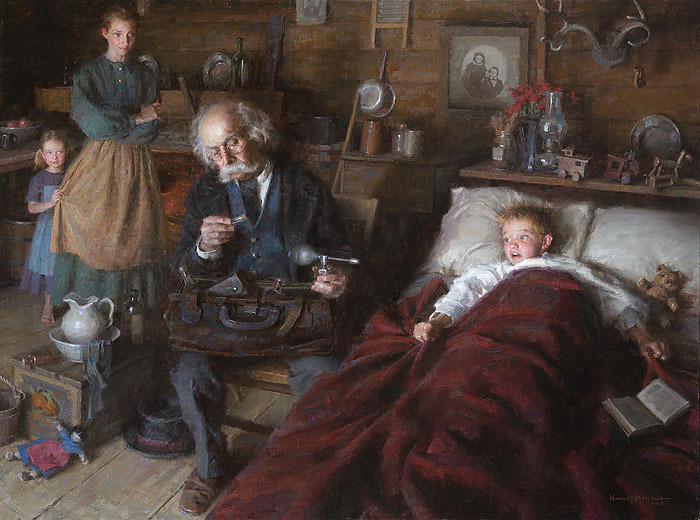 Weistling’s tribute to country doctors and the role they played in the development of early American tradition was awarded the Patron’s Choice Award for best painting at the 2013 Masters of the American West.